First off, I want to say a huge Thank You for all the sweet birthday wishes from yesterday ;) It was a lovely day spent with family and you just can't ask for more than that!! And Now, Today I am super excited to be sharing a new Moda Bake Shop Tutorial today!!!! It's called Top Spin and I just love it!!!! 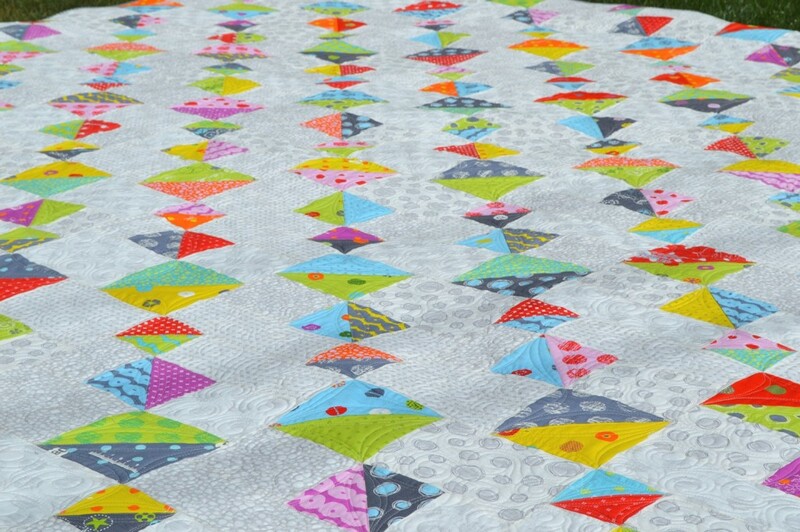 This is a whole lot of Half Square Triangle goodness in a fun diagonal layout that just gives it a wonderful geometric feel!!! 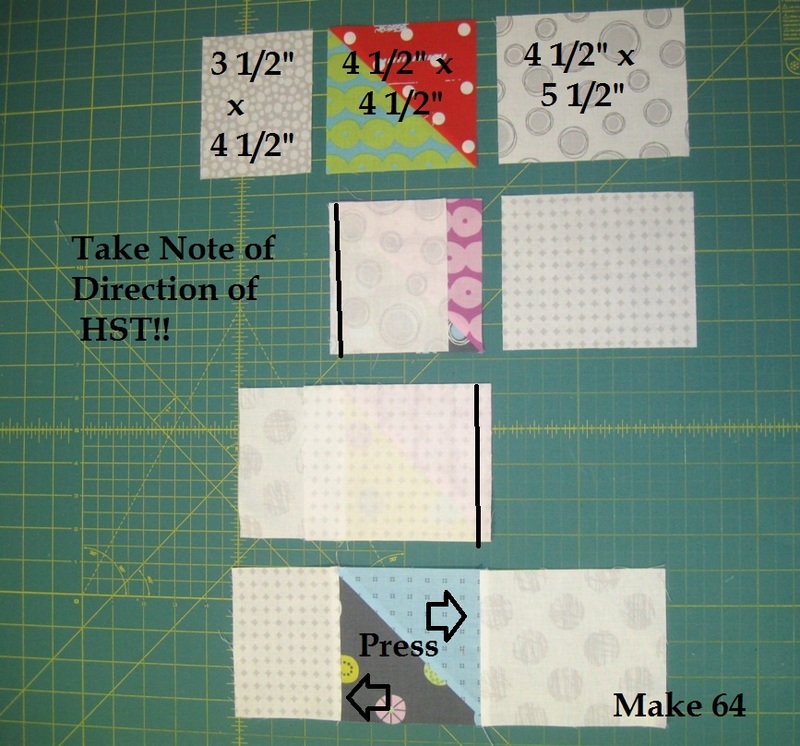 I just love the rotating sizes of HST's that really adds to the movement and dimension of the quilt. And the scrappy low volume background is just so fun!!!! 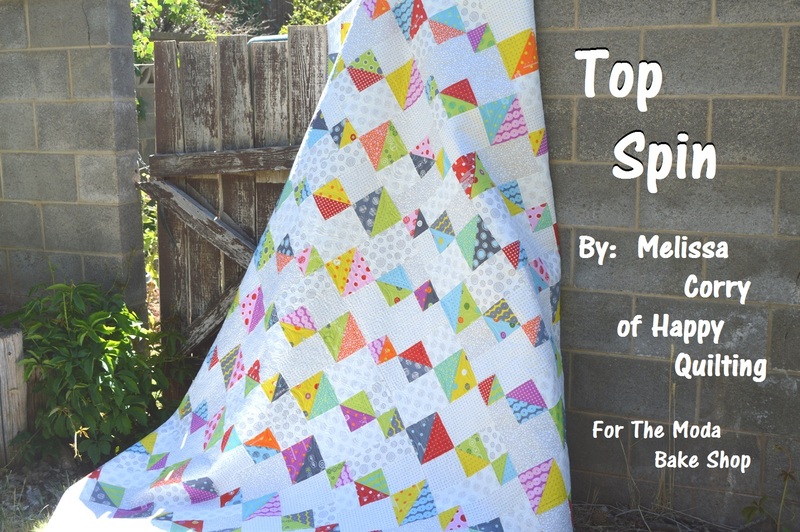 The fabrics in Top Spin are Zen Chic's new Hey Dot line. I just love the bright bold colors that just pop out from the fun white/light grey background prints. I mean, how can you not see this and smile at all of that bright polka dot goodness!!! Top Spin Finishes at 96" x 96". 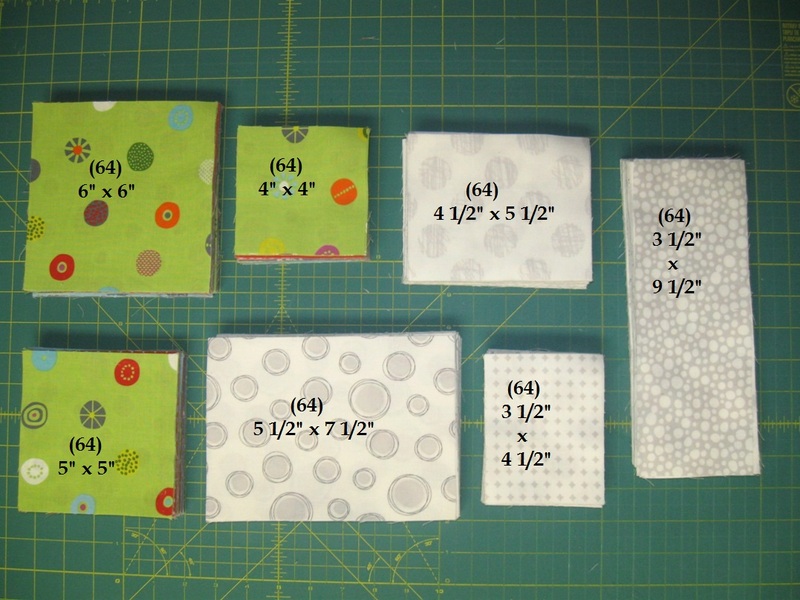 Cut (2) 6" x 6" squares, (2) 5" x 5" squares, and (2) 4" x 4" squares from each of the 32 Fat Quarters. And with all of the cutting done, we are ready to start sewing. We will start with Half Square Triangle Units. 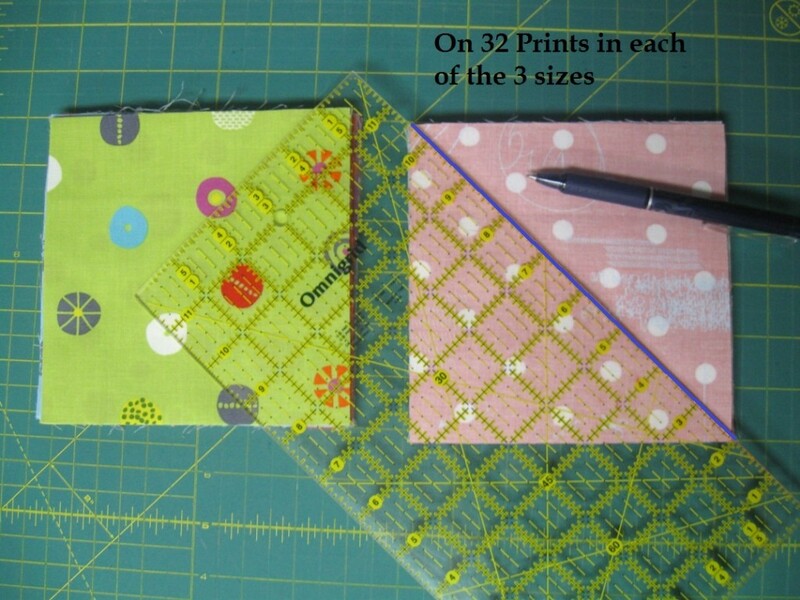 Gather 32 squares (that is 1 of each print) from each of your 3 sizes of squares. (So you should have 96 squares at the moment.) Draw a diagonal line on the wrong side of each squares. I like to use a Frixon pen so my lines will erase with heat. Now, place a marked square with an unmarked square of the same size with right sides together. Stitch a 1/4" seam along either side of the drawn line. You will be doing this for all 32 sets of each of the 3 sizes (96 sets total). 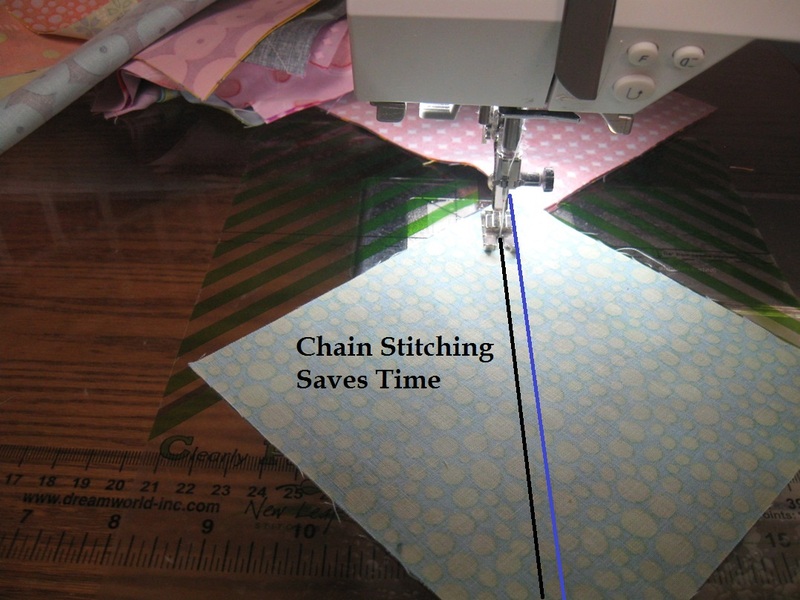 The easiest and quickest way to do this is to chain stitch. So go ahead and pair up all 96 sets. You can pin along either side of the drawn line if you like. 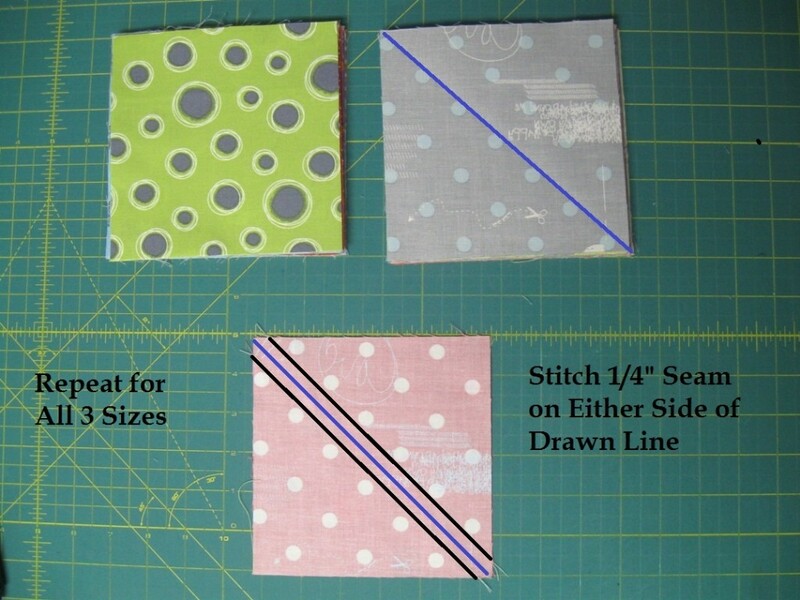 Then stitch a 1/4" seam along the left hand side of the line. 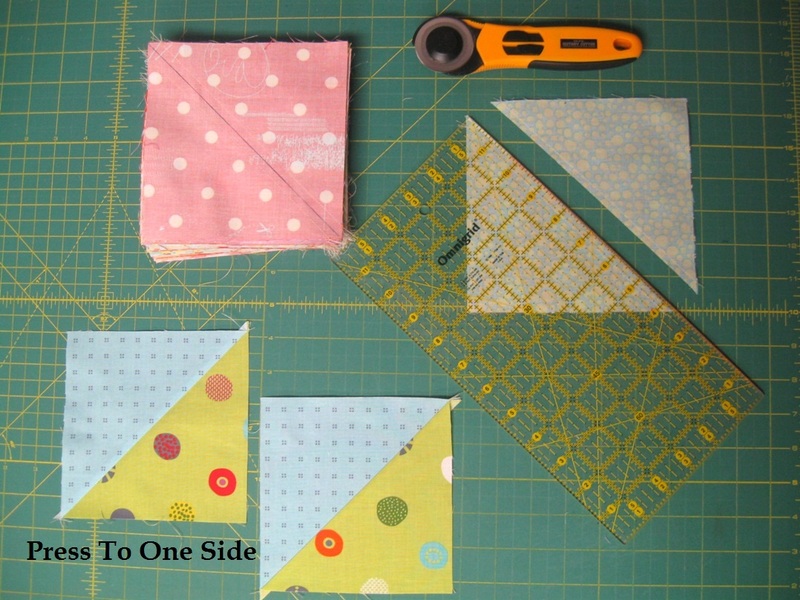 When you reach the end of one square, don't stop, just feed the next sew of squares into the machine. Continue in this fashion until you have stitched along the left hand side of all 96 sets in the 3 sizes. Then clip the threads in between your squares and get ready to do it all over again. Only this time, you are stitching on the right hand side of the drawn line. Again, feed all 96 sets through your machine and then clip the threads between the sets. Now, align your ruler along the drawn line and cut directly on the line. This creates 2 triangles. Go ahead and cut all 96 sets. And then you can move over to your ironing board. 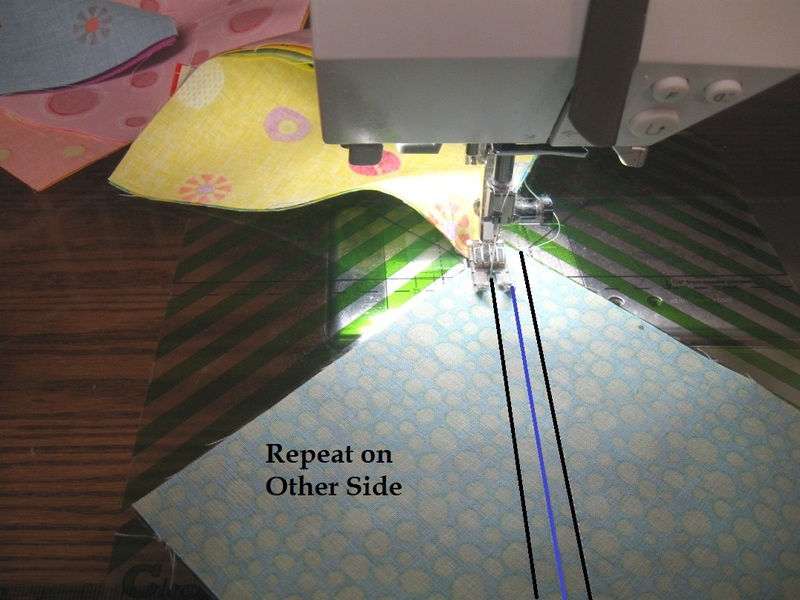 Press your seam allowances on all 192 Half Square Triangle units to one side. I like to press to the darker fabric. I know, it takes a little while to do all of that trimming, but trust me, it is totally worth it as it allows you to get super pretty points!!! 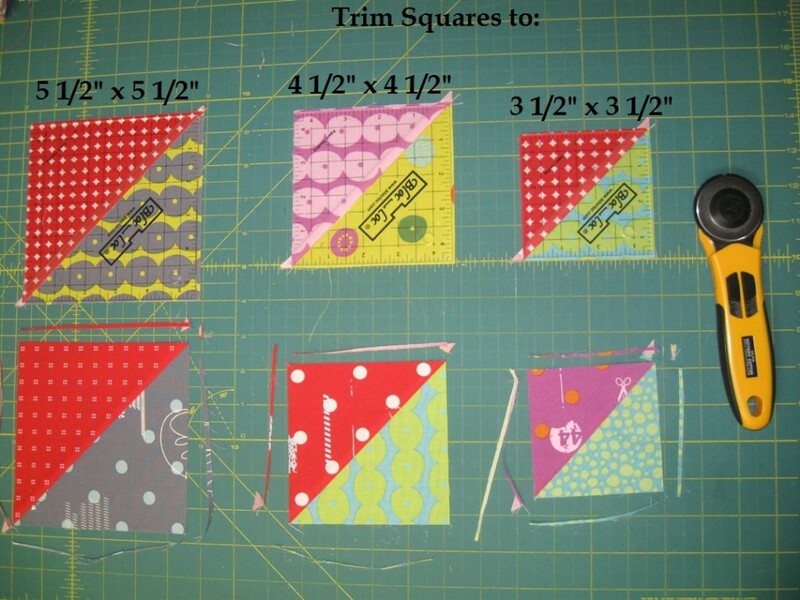 So now you should have 3 piles of 64 Half Square Triangle each trimmed perfectly to the following sizes. And now we can move on to making the block. There are 3 Rows in this block and we will start with the bottom row. Layout a 5 1/2" x 5 1/2" HST and a 5 1/2" x 7 1/2" background rectangle as shown below. Be Careful to make sure the HST is pointing in the same direction as shown (they are easy to get flipped around). 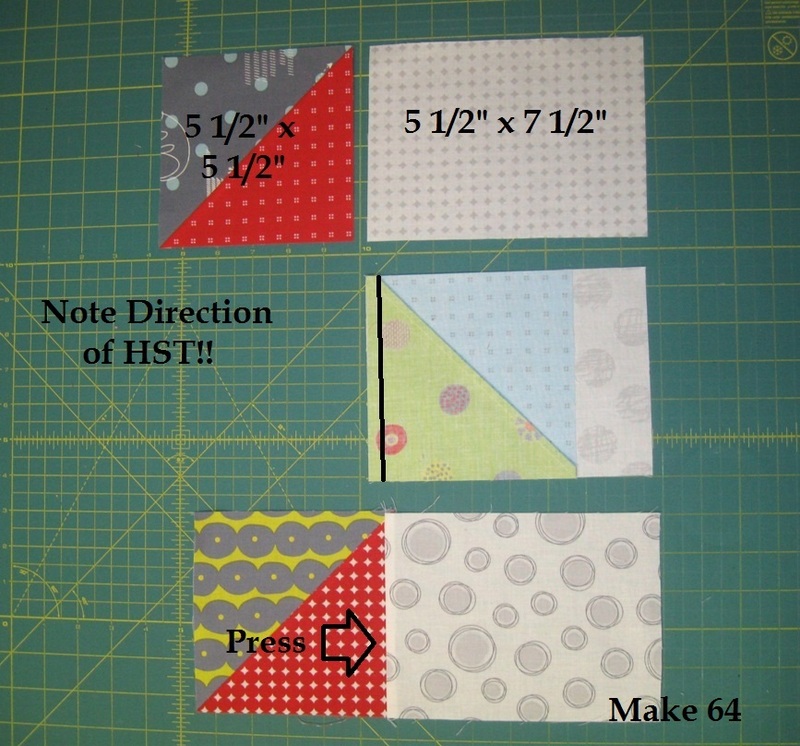 Place the HST onto the rectangle with right sides together and stitch a 1/4" seam along the edge. Press the seam allowance towards the background rectangle. Repeat to make 64 Bottom Rows. And onto the Top Row. Layout a 3 1/2" x 3 1/2" HST and a 3 1/2" x 9 1/2" background rectangle as shown below. Again, double check the HST placement. Place the HST onto the rectangle with right sides together and stitch a 1/4" seam along the edge. 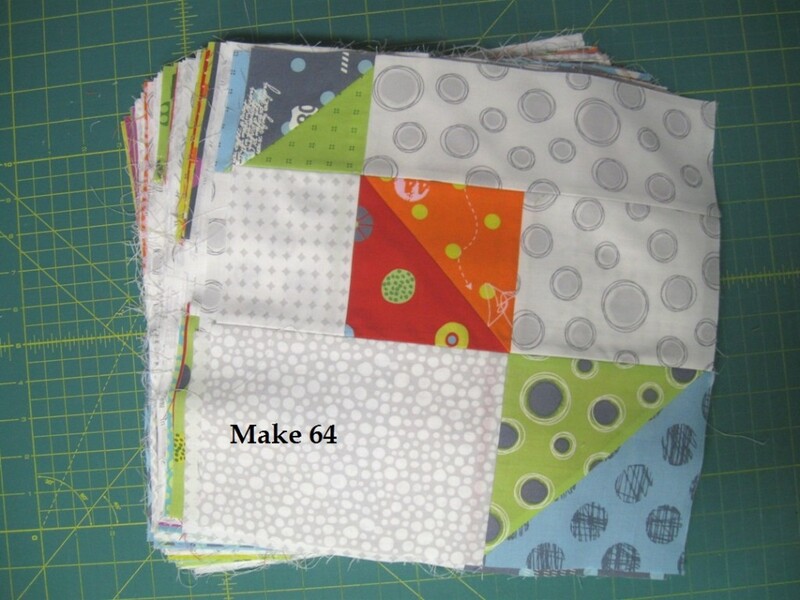 Press the seam allowance towards the background rectangle. Repeat to make 64 Top Rows. And finally, the Center Row. Layout a 3 1/2" x 4 1/2" background rectangle, a 4 1/2" x 4 1/2" HST and a 4 1/2" x 5 1/2" background rectangle as shown below. Double check that HST. Place the 3 1/2" x 4 1/2" background rectangle onto the HST with right sides together and stitch a 1/4" seam along the edge. Then place the 4 1/2" x 5 1/2" rectangle onto the now sewn together HST with right sides together and stitch a 1/4" seam along the edge. Press the seam allowances outwards toward the background rectangles. Repeat to make 64 Center Rows. Start by sewing the Top and Center Row together. Place the Top Row onto the Center Row with right sides together. Nest (and Pin if you like) the seam together and stitch a 1/4" seam along the edge. 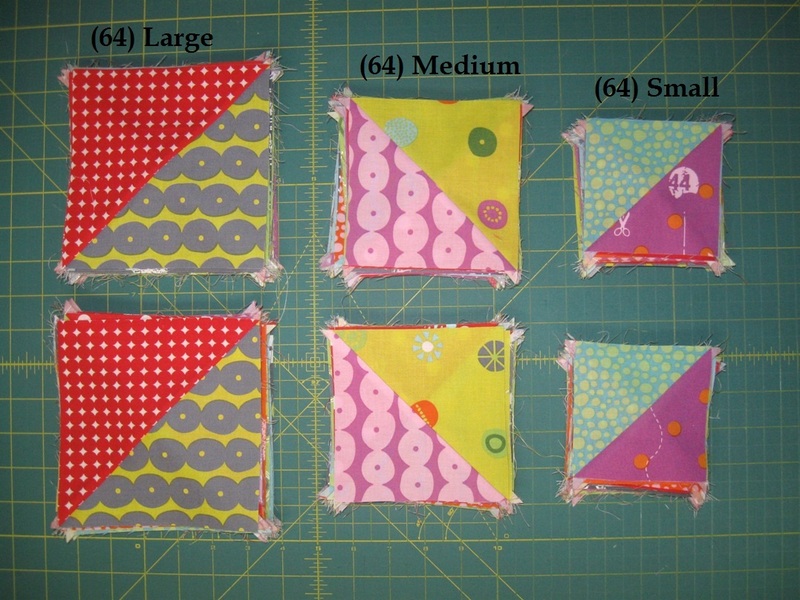 Then place the Bottom Row onto the now sewn together Top and Center Row with right sides together. 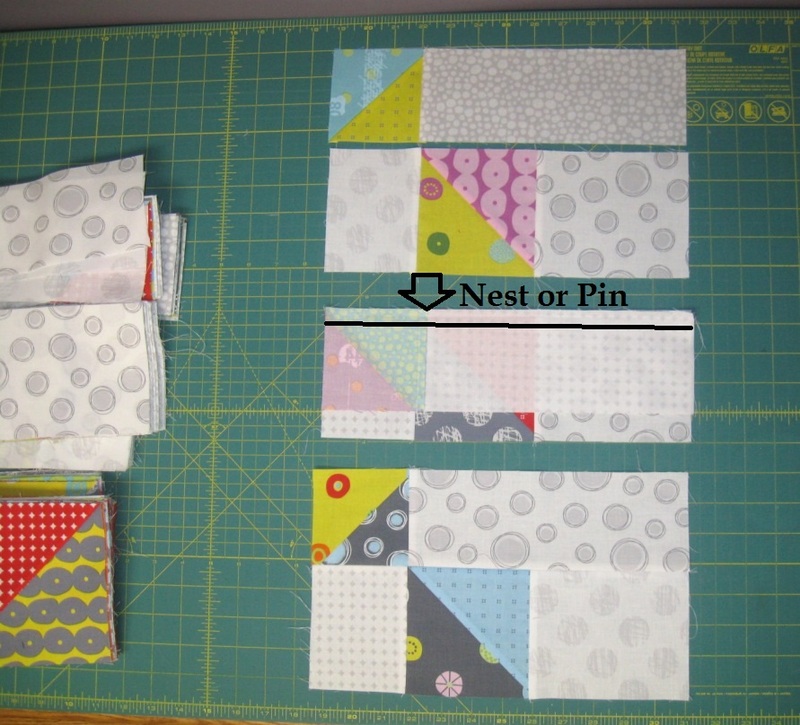 Nest (and pin if you like) the Rows together and sew a 1/4" seam along the edge. Then press the seam allowances open. 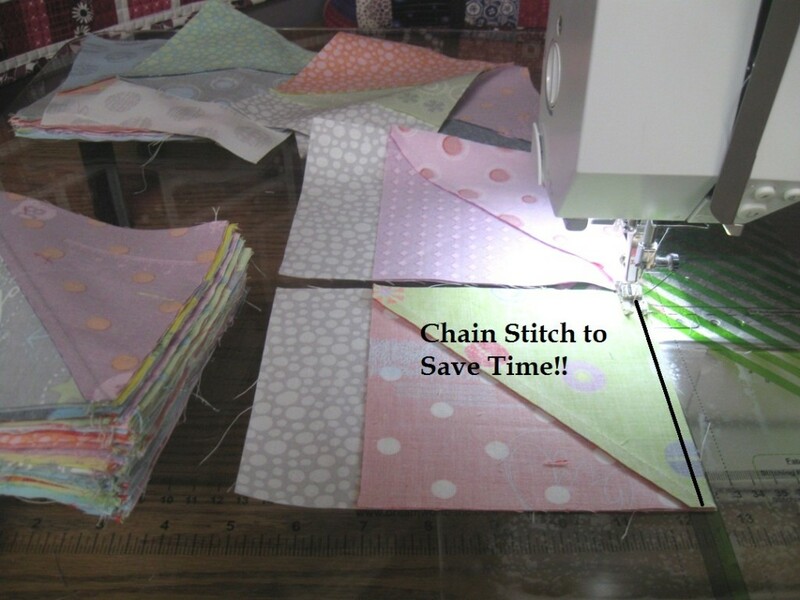 Repeat or Chain Stitch for all 64 Blocks. They should measure 12 1/2" x 12 1/2" unfinished. 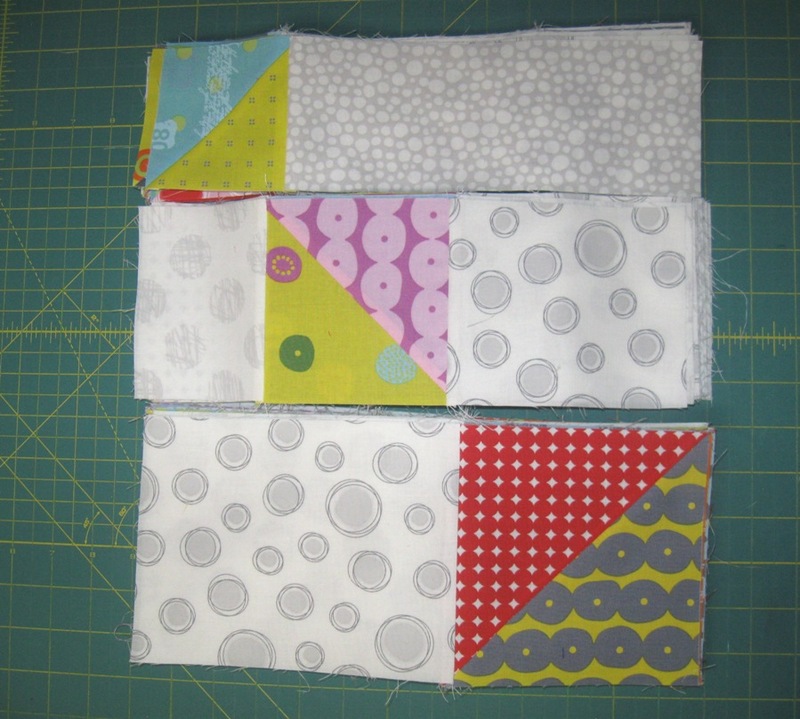 And now, the blocks are ready to be sewing into a quilt top. There are 2 different row layouts in this quilt and 4 rows of each layout. Layout your blocks in the following two layouts, stacking 4 rows on top of each layout. Now you can sew the rows together. 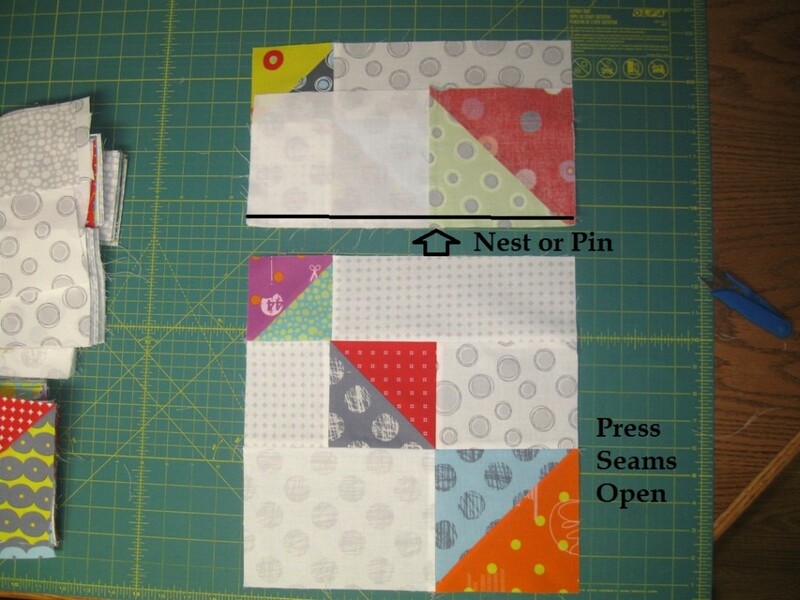 To do this, place the second block onto the first with right sides together and pin if you like. Stitch a 1/4" seam along the edge. (shown in row 2) Now place the Third block onto the now sewn together Blocks 1 and 2 with right sides together and pin if you like. Stitch a 1/4" seam along the edge. (shown in row 3). 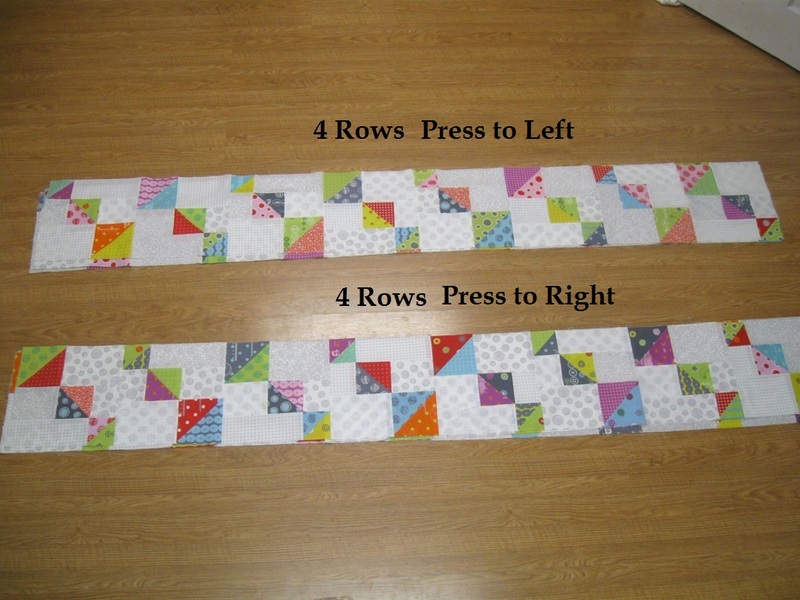 Continue in this fashion until you have sewn all the blocks in the row together. 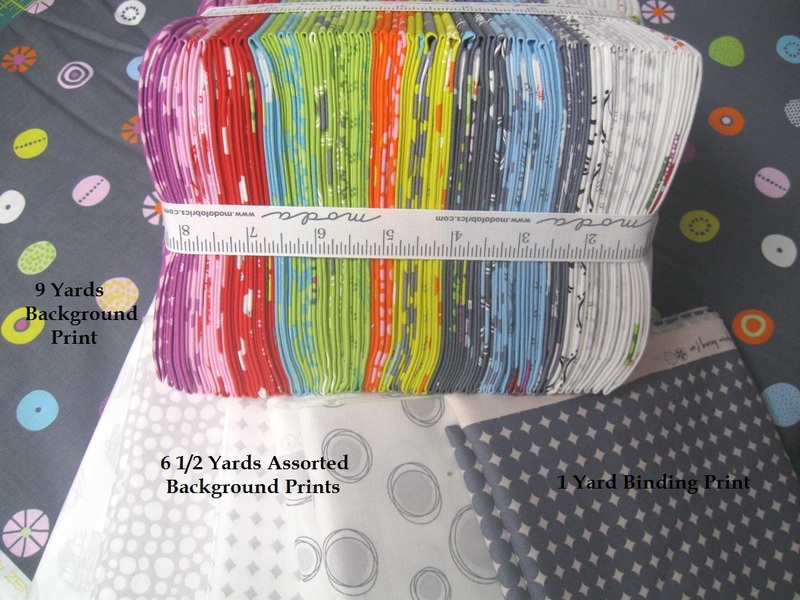 Then repeat to sew all 8 rows together, 4 rows each of the 2 different layouts. Press the 4 rows in the first layout to the left and Press the 4 roes in the second layout to the right. This will allow you to nest them later. And now, all that is left is sewing the rows into a quilt top. 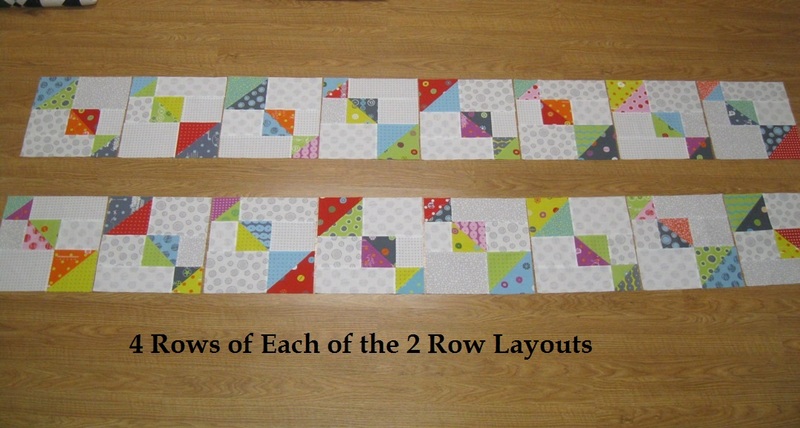 (Sorry, my room is a little small for this large quilt, it didn't quite all fit in the picture ;) Layout your rows alternating the two row layouts as shown below. 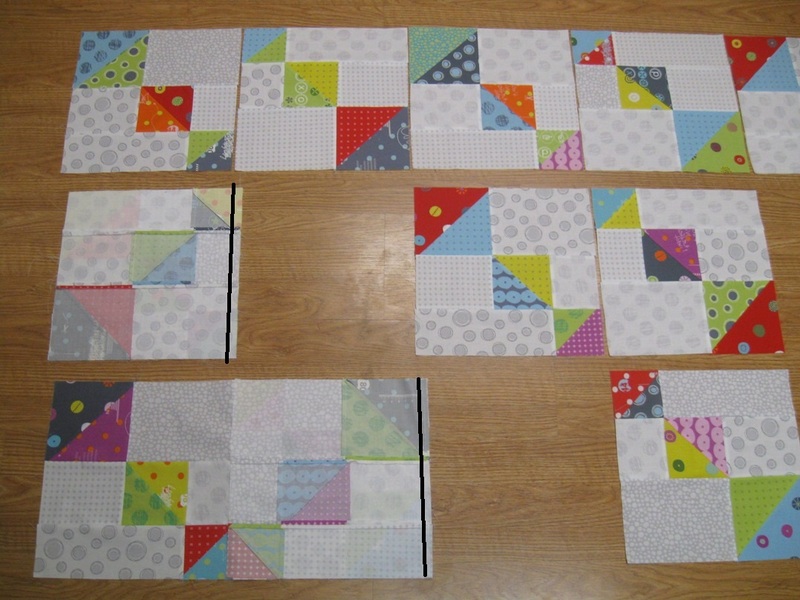 And now it is just like sewing the blocks into rows, only on a much larger scale. Place the first row onto the second row with right sides together. Nest and Pin the seams together. Stitch a 1/4" seam along the edge. 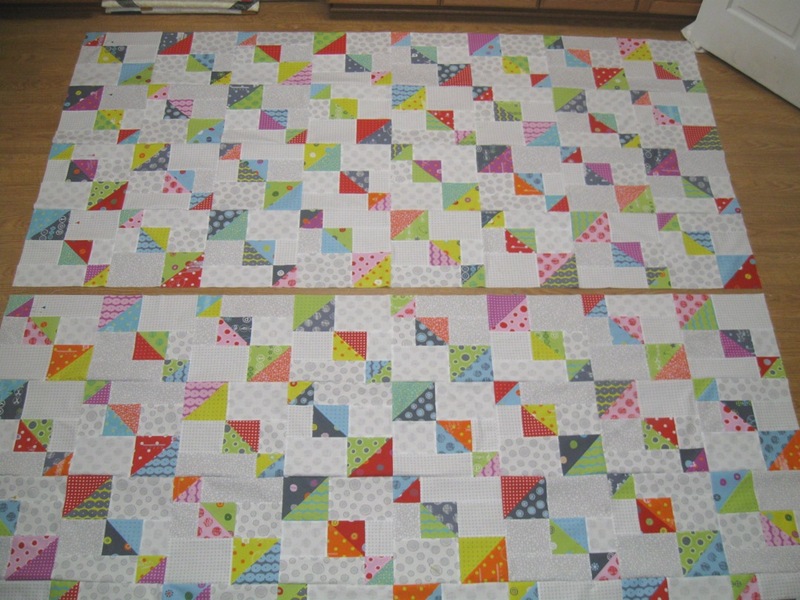 Now, place the third row onto the now sewn together first and second row with right sides together. Nest and Pin the seams together. Stitch a 1/4" seam along the edge. Continue in this fashion sewing the rows together. I like to sew the first 4 rows together and then start over sewing the last 4 rows together. This just means I have less bulk at the machine to deal with ;) And then all that is left is to place the two halves together with right sides together, nest and pin the seams, and then sew a 1/4" seam along the edge. 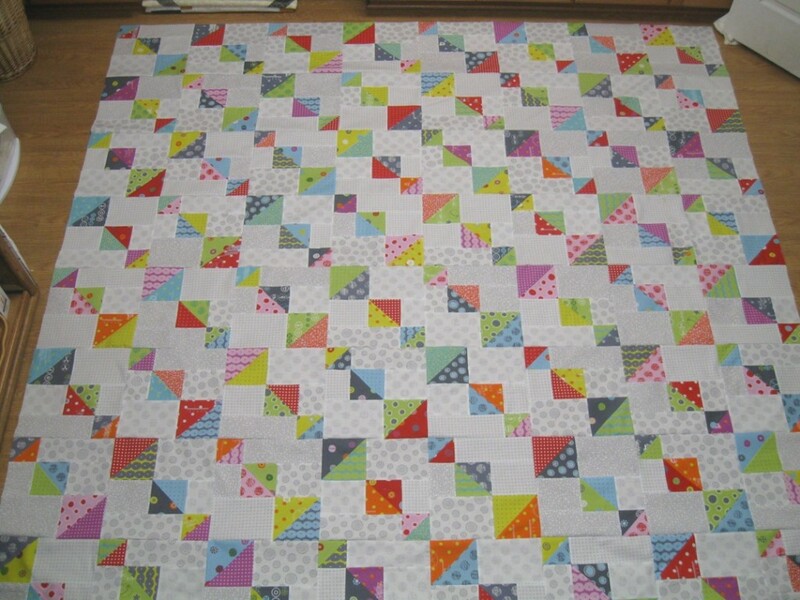 And your quilt top is all sewn together!!! 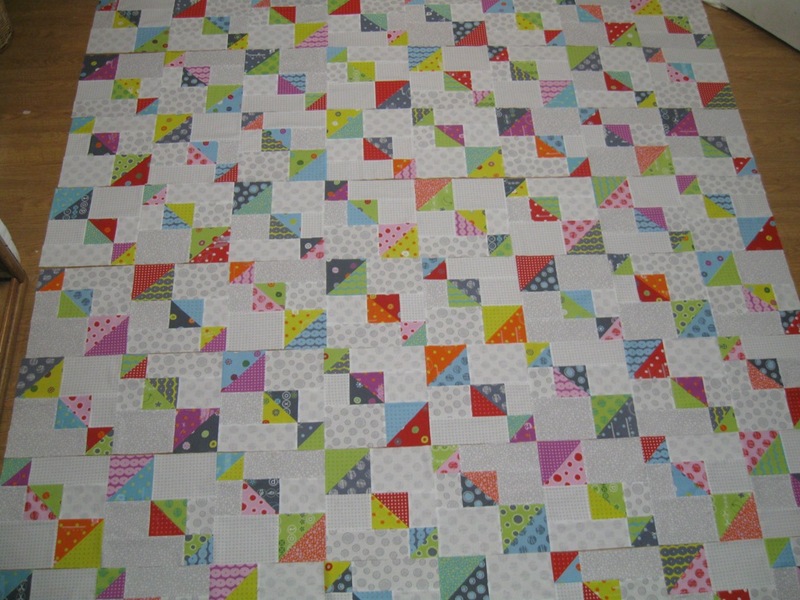 Now just press the seams to one side or open, whichever your prefer, and you quilt top is done!!! Wasn't that so fast and fun!!! I had a lot of fun quilting up this quilt ;) I quilted my favorite small Swirl and Curl in the Background and double arches in the HST's. You can really see how it stands out on the awesome backing fabric, so fun!!! I hope you have enjoyed this tutorial and find it easy to follow. If you make your own Top Spin Quilt I would love to see it!! You can email me a picture at happyquiltingmelissa@gmail.com or or post it to social media with the hashtag #happyquiltingwithmc add it to my flickr group here ;) I can't wait to see your Top Spin Quilts!!! 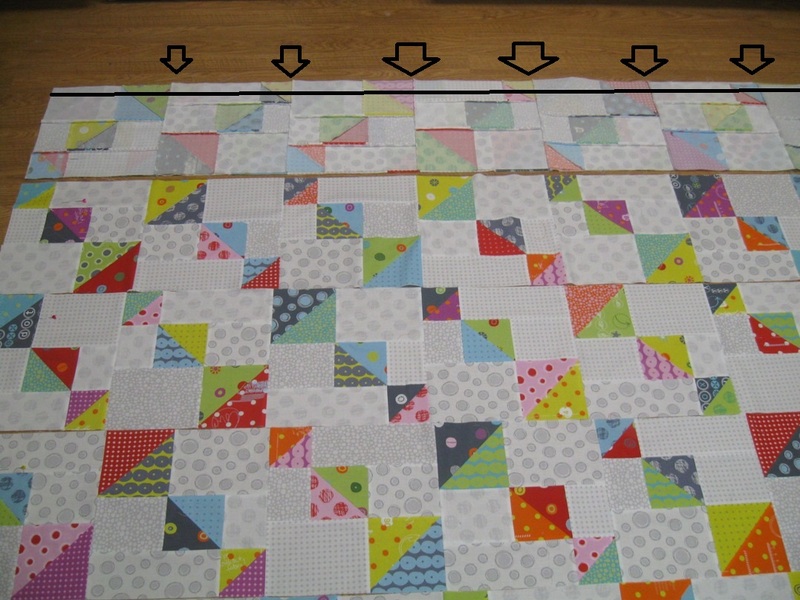 This quilt is so fun in a matching line, but it would also be a great scrap buster quilt!!! Think of all the low volume scraps you could burn through and how fun it would be to selectively pick out fabrics for all of those wonderful HST's. And you could also piece all those HST's as Leaders And Enders so it could be one of those awesome bonus quilts too ;) So fun!!! 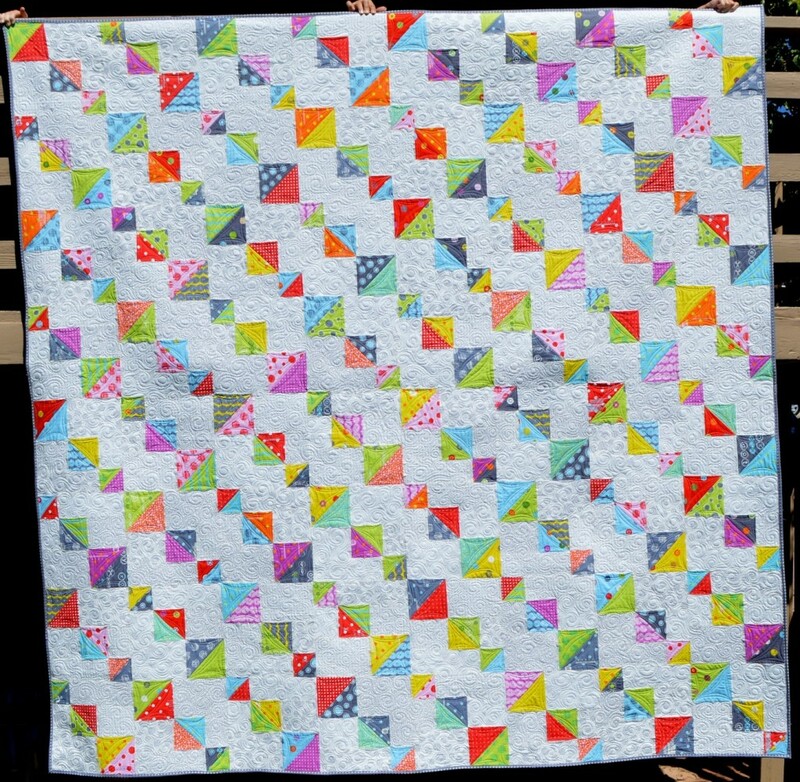 And one last note on Top Spin that really makes me smile :) I made this quilt specifically for a family member that is having some health struggles at the moment. And I got the nicest picture from her the other day of it on her bed and a note of how happy it makes her. And that is why I love making quilts, they really are warm hugs that can be shared each day!!!! Such a great quilt design. Before I saw the designer's name, I thought, "That looks like a Melissa quilt." And it was. I have the same feeling as you, I love to see my quilts used. You hit the nail on the head about why I quilt too. Giving family and friends quilty love is my motivator. Thanks for a great pattern to scrap bust too! I just love this! It's happy and has a great spark. I have some HST I've been hoping to find a home for. Not near enough for this, but a nice start. Must be a sign. Hope your quilt recipient is feeling better soon. This is beautiful! I love the colors and the backing is adorable! Great job! I'm looking forward to what you do next! Happy Birthday a day late! What a beautiful quilt and such a special gift for your family member. I love quilt hugs and the smiles that come from the receivers of my quilts. 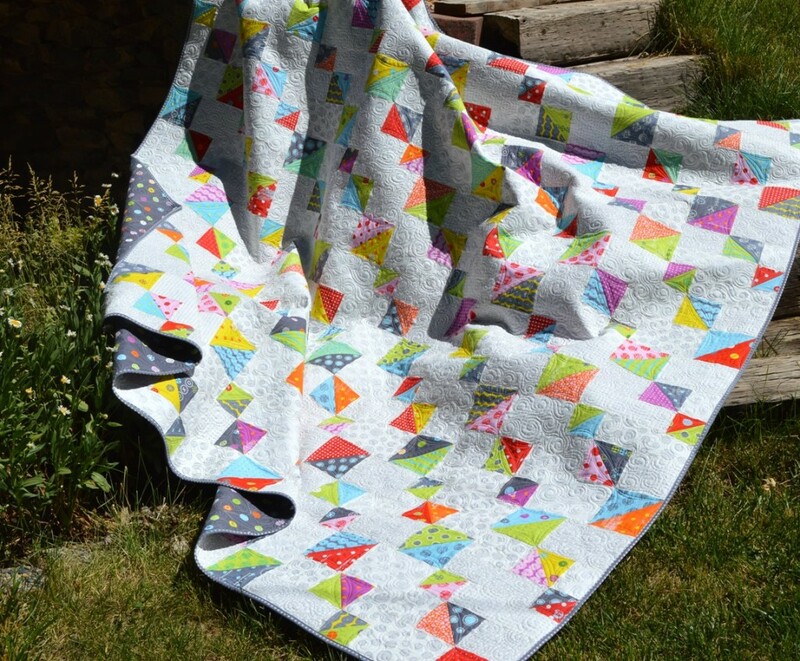 This is a wonderfully fun quilt! 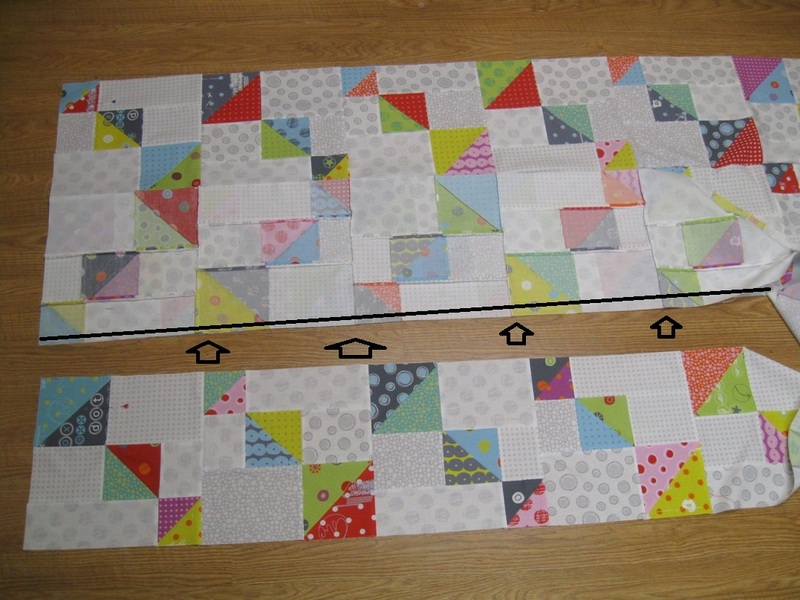 I downloaded the pattern from MBS and purchased a bloc loc ruler (why didn't I think of that?!) - can't wait to try it out! Thanks so much for sharing the new tool info and a happy pattern! This is super rad. And with the quilty knowledge I've gleaned from being a follower of yo for so long I think I've figured out the blocks just by looking at a big picture! Quite rad! Happy belated birthday Melissa! 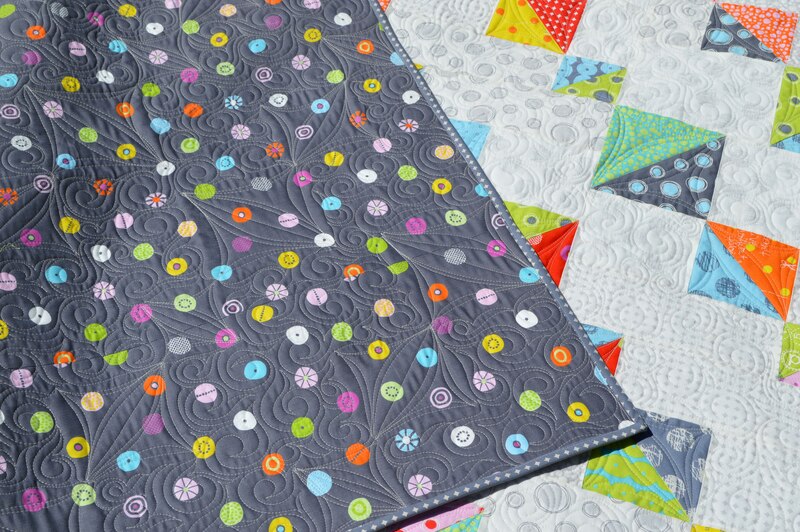 Very cute quilt too! I love Top Spin! 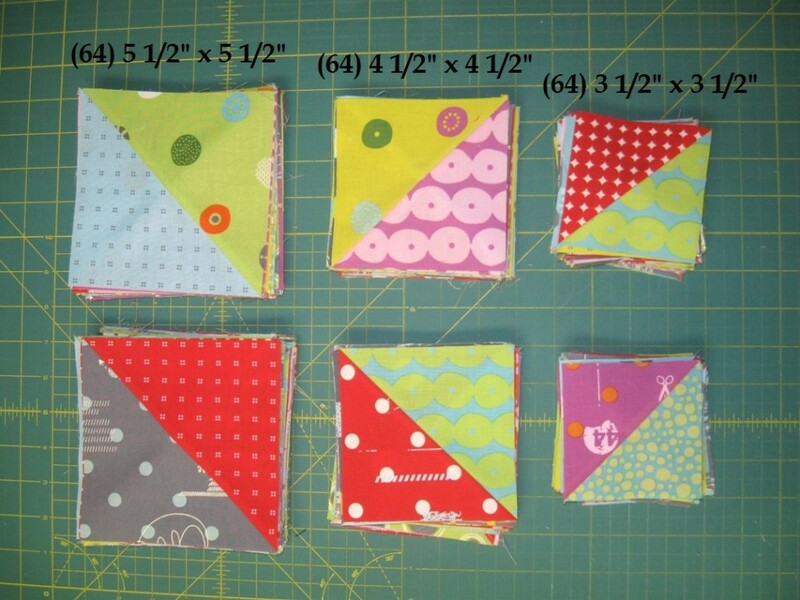 I have a big question tho' :) I'd like to make it smaller with perhaps 8" blocks. Is there a possibility that you have those measurements? Of course, I can't figure it out on my own! :) Thanks! 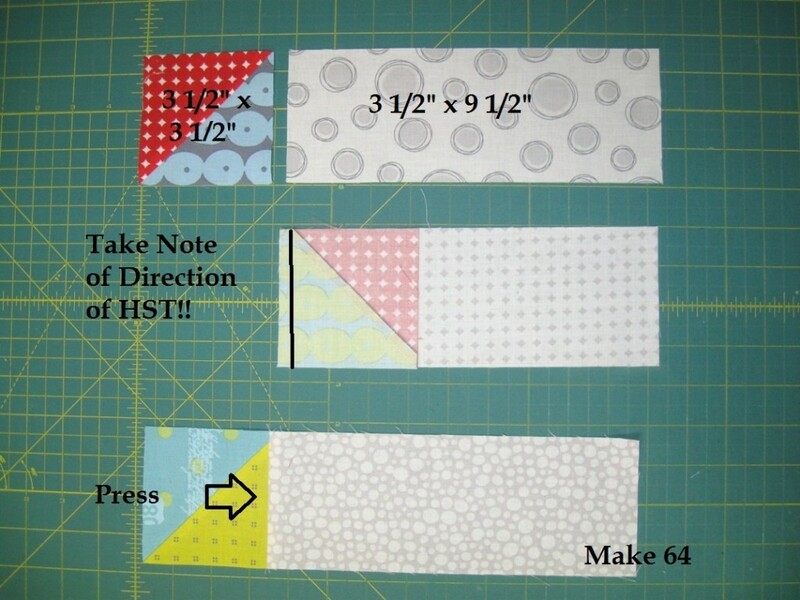 That's the perfect quilt design to use up my collection of HSTs! Thanks you!